Carnassials are paired upper and lower teeth (either molars or premolars and molars) modified in such a way as to allow enlarged and often self-sharpening edges to pass by each other in a shearing manner. The modification arose separately in several groups of carnivorous mammals. Different pairs of teeth were involved in the separate modifications. In modern Carnivora, the carnassials are the modified fourth upper premolar and the first lower molar. These teeth are also referred to as sectorial teeth. Humans lack carnassial teeth. 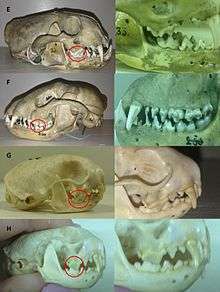 Left: Carnassial teeth of [A] bear (Ursus), [B] leopard (Panthera), [C] dog (Canis), [D] badger (Meles), and their respective close ups. Right: Carnassial teeth of [E] otter (Lutra), [F] raccoon (Procyon), [G] mongoose (Herpestes), [H] weasel (Mustela), and their respective close-ups. Photos taken at Imperial College London. Carnassial teeth are modified molars (and in the case of carnivorans premolars) which are adapted to allow for the shearing (rather than tearing) of flesh to permit the more efficient consumption of meat. These modifications are not limited to the members of the order Carnivora, but are seen in a number of different mammal groups. Not all carnivorous mammals, however, developed carnassial teeth. Mesonychids, for example, had no carnassial adaptations, and as a result, the blunt, rounded cusps on its molars had a much more difficult time reducing meat. Likewise, neither members of Oxyclaenidae nor Arctocyonidae had carnassial teeth. On the other hand, carnivorous marsupials have carnassial teeth. Both the living Tasmanian devil (Sarcophilus harrisii) and the recently extinct Tasmanian wolf (Thylacinus cynocephalus) possessed modified molars to allow for shearing, although the Tasmanian wolf, the larger of the two, had adaptation more similar to the modern dog. The Pleistocene marsupial lion (Thylacoleo carnifex) had massive carnassial molars. A recent study concludes that these teeth produced the strongest bite of any mammal in history. Moreover, these carnassial molars appear to have been used, unlike in any other known mammal, to inflict the killing blow to the prey by severing the spinal cord, crushing the windpipe or severing a major artery. Like these true marsupials, the closely related borhyaenids of South America had three carnassial teeth involving the first three upper molars (M1-M3) and the second through fourth lower molars (m2-m4). In the borhyaenids the upper carnassials appear to have been rotated medially around the anteriorposterior axis of the tooth row in order to maintain tight occlusional contact between the upper and lower shearing teeth. Creodonts have two or three pairs of carnassial teeth, but only one pair performed the cutting function: either M1/m2 or M2/m3, depending on the family. In Oxyaenidae, it is M1 and m2 that form the carnassials. Among the hyaenodontids it is M2 and m3. Unlike most modern carnivorans, which the carnassials are the sole shearing teeth, in the creodonts other molars have a subordinate shearing functions. The fact that the two lineages developed carnassials from different types of teeth has been used as evidence against the validity of Creodonta as a clade. Modern carnivorous bats generally lack true carnassial teeth, but the extinct Necromantis had particularly convergent teeth, in particular M1 and M2, which bore expanded heels and broad stylar shelves. These were particularly suited for crushing over an exclusively slicing action. Though not superficially similar, the triconodont teeth of some early mammals such as eutriconodonts are thought to have had a function similar to those of carnassials, sharing a similar shearing function. Eutriconodonts possess several speciations towards animalivory, and the larger forms such as Repenomamus, Gobiconodon and Jugulator probably fed on vertebrate prey. Similarly the "tooth lips" of clevosaurid sphenodontians such as Clevosaurus are described as "carnassial-like". In modern carnivorans the carnassial teeth pairs are found on either side of the jaw and are composed of the fourth upper pre-molar and the first lower molar (P4/m1). The location these carnassial pairs is determined primarily by the masseter muscle. In this position, the carnassial teeth benefit from most of the force generated by this mastication muscle, allowing for efficient shearing and cutting of flesh, tendon and muscle. The scissor-like motion is created by the movement between the carnassial pair when the jaw occludes. The inside of the fourth upper pre-molar closely passes by the outer surface of the first lower molar, thus allowing the sharp cusps of the carnassial teeth to slice through meat. the size of the chunk of meat that can be swallowed. Video demonstrating the shearing action of the carnassial teeth in a weasel (Mustela) jaw. Filmed at Imperial College London. Video demonstrating the shearing action of carnassial teeth in a dog (Canis) jaw. Filmed at Imperial College London. A comparison of the size and shape of carnassial teeth in: [A] bear (Ursus), [B] leopard (Panthera), [C] dog (Canis), [D] badger (Meles), [E] otter (Lutra), [F] raccoon (Procyon), [G] mongoose (Herpestes), [H] weasel (Mustela). Photo taken at Imperial College London. The fossil record indicates the presence of carnassial teeth 50 million years ago, implying that Carnivora family members descend from a common ancestor. The shape and size of sectorial teeth of different carnivorous animals vary depending on diet, illustrated by the comparisons of bear (Ursus) carnassials with those of a leopard (Panthera). Bears, being omnivores, have a flattened, more blunt carnassial pair than leopards. This reflects the bear's diet, as the flattened carnassials are useful both in slicing meat and grinding up vegetation, whereas the leopard's sharp carnassial pairs are more adapted for its hypercarnivorous diet. During the Late Pleistocene – early Holocene a now extinct hypercarnivorous wolf ecomorph existed that was similar in size to a large extant gray wolf but with a shorter, broader palate and with large carnassial teeth relative to its overall skull size. This adaptation allowed the megafaunal wolf to predate and scavenge on Pleistocene megafauna. Wear and cracking of the carnassial teeth in a wild carnivore (e.g. a wolf or lion) may result in the death of the individual due to starvation. 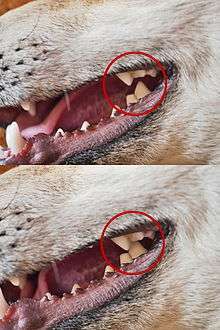 Carnassial teeth infections are common in domestic dogs, and present as abscesses. Extraction of the tooth and antibiotics are necessary to ensure that no further complications occur. ↑ Osborn, Henry Fairfield (1907). Evolution of mammalian molar teeth. Macmillan. Retrieved 20 January 2011. ↑ Prothero, Donald R. (2012). Bringing Fossils to Life: An Introduction to Paleobiology. New York: Columbia University Press. p. 550. ISBN 978-0231158930. ↑ Wortman, Jacob Lawson (May 1901). “Studies of Eocene Mammalia in the Marsh Collection, Peabody Museum,” American Journal of Science 11 reprinted in Wortman, Jacob Lawson. "Collected Papers". n.p. p. 285. ↑ Ettelson, Zara Henrietta (March 1915). "Essay: A Brief Outline of the Teeth of Marsupialia". Northwestern Dental Journal. pp. 13–15. ↑ Wroe, Stephen (2007). "Cranial mechanics compared in extinct marsupial and extant African lions using a finite element approach". Journal of Zoology. pp. 332–339. ↑ Marshall, Larry G. (1978). "Evolution of the Borhyaenidae, Extinct South American Predaceous Marsupials". University of California Publications in Geological Sciences. 117: 10–12. ↑ Gunnell, Gregg F. (1998). "Creodonta." pp. 91-109 at p. 91 in C.M. Janis, K.M. Scott, and L.L. Jacobs (eds.) Evolution of Tertiary Mammals of North America. Volume 1: Terrestrial Carnivores, Ungulates, and Ungulatelike Mammals. Cambridge University Press, Cambridge. ISBN 0-521-35519-2. ↑ Matthew, William Diller (August 1909). "The Carnivora and Insectivora of the Bridger Basin, Middle Eocene". Memoirs of the American Museum of Natural History. pp. 289–576. The discussion concerning creodont carnassials is found at page 321. ↑ Matthew, William Diller (August 1909). "The Carnivora and Insectivora of the Bridger Basin, Middle Eocene". Memoirs of the American Museum of Natural History 9. pp. 289–576. ↑ Zofia Kielan-Jaworowska, Richard L. Cifelli, Zhe-Xi Luo (2004). "Chapter 7: Eutriconodontans". Mammals from the Age of Dinosaurs: origins, evolution, and structure. New York: Columbia University Press. pp. 216–248. ISBN 0-231-11918-6. ↑ Feldhamer, George A.; Drickamer, Lee C.; Vessey, Stephen H.; Merritt, Joseph F.; Krajewski, Carey (2015). Mammalogy: Adaptation, Diversity, Ecology. Baltimore: Johns Hopkins University Press. p. 356. ISBN 978-0801886959. ↑ Cope, Edward Drinker (1879). "The Origin of the Specialized Teeth of the Carnivora". The American Naturalist. 13: 171–173. doi:10.1086/272297. ↑ Savage, R.J.G. (1977). "Evolution in carnivorous mammals". Paleontology. 20: 237–271. ↑ Leonard, J (2007). "Megafaunal extinctions and the disappearance of a specialized wolf ecomorph". Curr Biol. 17: 1146–50. doi:10.1016/j.cub.2007.05.072. PMID 17583509.